I have mentioned the use of the elements in rituals. 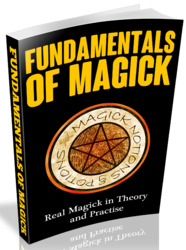 In magick, there are four elements - Earth, Air, Fire and Water. They all contain symbolic qualities and powers that together form the energies used in rituals. Each element controls a quadrant in the magical circle. Earth, in the North, represents the stability, security and strength of old stone circles, mighty castle walls, tall craggy rocks and mountain peaks. It is also associated with the time of midnight and winter. Salt is often used to represent Earth in spells and rituals. Air, in the East, is action, freshness and power for change, the winds blowing across plains, vast, cloudless skies stretching endlessly, storms and whirlwinds stirring stagnation but also bringing destruction of the old. Air is also associated with the dawn and spring. 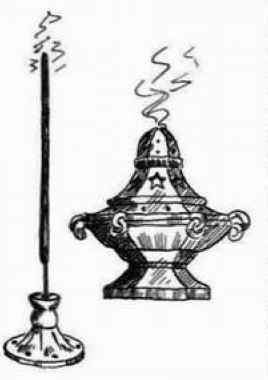 Incense is often used to represent Air in spells and rituals. Fire, in the South, is the quicksilver, inspirational energy and clear light of the Sun, the lightning flash. It is the hearth fire that warms, the ritual fire that cleanses, the forest fire that sweeps all away. It represents the full power of the Sun and light at noon and in summer. Candles are used to represent Fire. Finally, in the West is Water, that falls as refreshing rain, tides that ebb and flow, watercourses always finding a way, moving ever onwards, never backwards. Water is associated with autumn and sunset. It represents the changing responsive, human emotions of life cycles, and personal ebbs and flows of energies. Water is used to represent its own element.